Fishers and farmers have for some time tried to block a proposed dam on the Mekong River in southern Lao People’s Democratic Republic (Lao PDR). Most recently, they made their views known at a public consultation on the Don Sahong dam. In all likelihood, however, they will lose and the dam will be built. “Great Gamble on the Mekong,” a new documentary from filmmaker and journalist Tom Fawthrop, insightfully details the probable dire consequences of this dam, and the failure this represents for a once-promising extra-legal cooperative structure, the Mekong River Commission. The Mekong runs from the Himalayas in Tibet through China, Burma, Thailand, Lao PDR, Cambodia, and Vietnam—the latter five forming the Lower Mekong Basin (LMB)—where it empties into the South China Sea. According to Fawthrop, it provides protein and food security for 65 million people in the form of fish for food and trade, and water and nutrients for home gardens and commercial farms. At the same time, the Mekong has long represented a potential source of renewable energy. China has already built 6 dams on the Upper Mekong, and plans to build at least 14 more. Dams have been discussed and rejected on the Lower Mekong mainstream since the 1950s, though they have gone up on its tributaries in that time. In 1995 Thailand, Lao PDR, Cambodia, and Vietnam signed the Mekong Agreement and formed the Mekong River Commission (MRC). The goal of the MRC is to facilitate cooperation in managing the resources of the Lower Mekong, but it has no final decision-making power. The Lao government and the Finnish company Poyry it hired to oversee construction of Xayaburi claim that dam will provide clean energy to 3 million people in Thailand and 1 million in Lao PDR. The MRC claims dams on the Lower Mekong mainstream have the potential to reduce the severity of floods and droughts, and that building all 12 would generate $15 billion in economic activity, create 400,000 jobs, and reduce greenhouse gas emissions by 50 Mtons carbon dioxide/year by 2030. A study commissioned by the MRC, and completed by the International Center for Environmental Management (ICEM) in 2010, concluded that the 12 dams could meet 8 percent of the region’s energy needs by 2025. Lao PDR does plan to use the revenues from selling the energy produced by its dams for rural roads, health care, and education, though during the “concession period” (estimated by ICEM at 25 years) after dam completion, the bulk of revenues would go to the dams’ financiers and developers. According to the academics and nonprofit workers that Fawthrop interviews in “Great Gamble on the Mekong,” the exact impacts of the dams are impossible to predict, but they will likely be severe. “The Don Sahong dam will only push Cambodia and Vietnam closer to a food crisis,” said Chhith Sam Ath, an employee of the World Wildlife Fund in Cambodia. 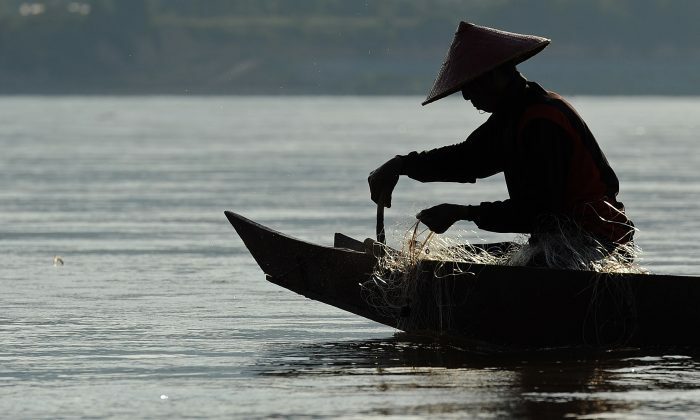 In addition to flooding gardens along the river, and diminishing the fish stock, they predict that the entrapment of nutrients by the dams will hurt rice production in Vietnam, leading to higher global food prices. The 2010 ICEM study concluded that building the 11 mainstream dams on the Lower Mekong would reduced “capture” (non-farmed) fisheries by 16 percent. Combined with the built and proposed dams on the Upper Mekong, and on tributaries in the Lower Mekong Basin, this number rises to 26–42 percent. New aquaculture associated with dams would only replace at most 10 percent of this loss. Lao PDR and its developers claim they can mitigate the losses of fish—Poyry claims fish gates will allow 80 percent of migratory fish to pass up and down streams, while MegaFirst, the Malaysian company planning to dam Hou Sahong, claims making adjacent channels wider and deeper will provide fish with a detour route. Yet the fish gates Poyry plans to use have never been tested on the varieties of fish found in the Mekong, and fish passes need to be designed to take into account individual species’ behavior and sensitivity to factors such as oxygen and nutrient levels. As Poyry’s senior project manager conceded, “Whether the fish get across [the dam], you’ll only see when it is built.” Faulting Lao PDR for not testing the fish gates in the Mekong before building a dam, when you need a dam to test the gates seems unfair. But they could test the technology on a smaller, less impactful dam on a tributary. In the face of this uncertainty, the ICEM report recommended putting off any mainstream dam construction until 2020, using the intervening years to more fully study the impacts of the dams on the Upper Mekong and on the tributaries of the Lower Mekong. In a five-year strategic plan issued in March 2011, the MRC Council also recommended more study, as well as a thorough Procedure of Notification, Prior Consultation, and Agreement (PNPCA), the internal procedure of the MRC for member countries to consider and offer feedback on the proposals of other countries. Yet eight months later, Poyry announced that Lao PDR had met its obligations under the 1995 agreement and could proceed with construction of Xayaburi. A year after that, in November 2012, Poyry received an eight-year contract to supervise Xayaburi’s construction and engineering, and construction began. Poyry claimed at the time that it had updated designs to take into account the concerns of downstream nations. Yet in January 2013, Cambodia and Vietnam vigorously protested that their concerns had not been addressed, and demanded a halt to construction. They were unsuccessful. A similar drama unfolded around the Don Sahong Dam. Last September, Lao PDR announced the start of the Don Sahong Dam, this time avoiding the PNPCA by claiming the project was not on the mainstream. After diplomatic outrage, the Lao government consented to a PNCPA, which began last July and is only required to run six months. Despite opposition from the governments and civil society in Vietnam and Cambodia, the Lao government has signaled its intention to proceed with the dam. These dams are the first major test of the MRC’s ability to handle conflict among its members. The MRC tasks members with “aiming at arriving at agreement” on projects that significantly impact water quality or flow but has no voting mechanism or penalties for not reaching agreement. The CEO of the MRC Secretariat, Hans Guttman, states in “Great Gamble” that if the parties don’t arrive at an agreement, the country proposing such a project can still go ahead with it. Citizens of Cambodia, Thailand, and Vietnam have lobbied their respective governments to halt the dam. Hundreds of NGOs, both local and international (including World Wildlife Fund and International Rivers), have been trying to mobilize the opposition. Thai villagers filed a lawsuit against EGAT, the National Energy Policy Council, and three other government agencies in 2012, challenging the power-purchasing agreement they entered into with the Lao PDR government for electricity from Xayaburi. In June 2014, the Thai Supreme Administrative Court agreed to hear the case. The international response, outside of the press, has been muted. MRC’s international donors issued a joint statement in January 2013 urging further study before beginning dam construction, but have said little else. The U.N. and heads of state have been notably silent. Fawthrop’s film does not address how concerned Westerners can respond. The answer certainly feels fraught, given Laos’s historical experience of French colonialism and U.S. military aggression, including the unexploded ordinance that still affects the country. Then there’s the region’s very real need for clean energy as well as the standard argument about the hypocrisy of industrialized nations telling any country to sacrifice growth for environmental protection. This is the progressive’s dilemma when it comes to foreign policy. Certainly any intervention should come in the form of carrots and not sticks: money and/or technology to develop less destructive sources of renewable energy; promotion of tourism to the region; UNESCO World Heritage Site recognition for Khone Falls, and so on, conditioned on implementing the ICEM report’s recommendations. What “Great Gamble on the Mekong” makes clear, and what studies of other massive dam projects have proved is that this is a humanitarian issue, and that the poorest will likely suffer the most. “Great Gamble on the Mekong” has some distracting elements. The claim that the Thai banks funding Xayaburi are “getting nervous” as a result of letters sent to them by anti-dam activists seems like wishful thinking. For the sake of their own credibility, the filmmakers shouldn’t have included a cartoon set to Pink Panther music. Finally, the filmmakers should have addressed how some species got to be endangered before any dams were built. For example a WWF report says that overfishing was partly responsible for the decline of the great catfish. These critiques aside, this is an important and stirring film. Nathaniel Eisen is a freelance author interested in the intersections of trade, human rights, security policy, and the environment. Information about the documentary “Great Gamble on the Mekong” can be found at www.tomfawthropmedia.com. Copies of the DVD can be ordered from eurekacuba@gmail.com. This article previously published on FPIF.org.